Woody plants are perennials (plants that live more than two years) that create stiff structures above ground that they use throughout their lives. They may be divided into three groups: trees, shrubs and vines. Trees and shrubs are self-supporting. Vines climb on other plants or on inanimate structures like a fence or a wall. They all develop an inner "backbone" - wood - for support and a tough outer "skin" - bark - for protection. This strategy allows them to get closer to the sun. All plants are in competition with each other for sunlight, which is the energy source that they capture to power photosynthesis within their cells. Any plant that can grow taller than its neighbors will be more successful in this competition. A woody stem allows this. In order to move water and nutrients efficiently within themselves, woody plants had to develop a plumbing system. Just underneath the bark is a layer of plant tissues that serves this function. This is actually the only part of the trunk that is alive. It is called the Cambial Layer (red arrow). Within the cambial layer, one kind of tissue transports liquids from the roots to the leaves. This is called the Xylem. Another transports liquids from the leaves to the roots and also laterally above ground. This is called the Phloem. As the plant grows it constantly renews both of these. Only the new xylem and phloem transport water and nutrients. The old xylem tissue becomes the wood and the old phloem tissue becomes the bark. 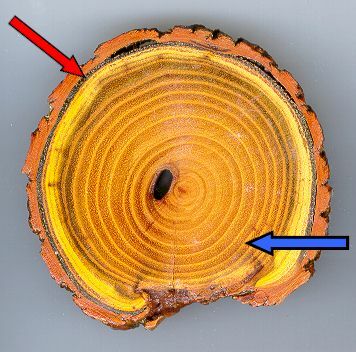 Since this tissue creation is very slow in winter, the creation of new wood slows down, resulting in an annual growth ring (blue arrow) that can be seen in this cross-section of a Black Locust tree branch. Other perennials, such as grasses, persist from year-to-year only in their root and root crown. They do not re-use in the following year the structures they build above ground during the growing season. They succeed through prolific seed-production, a greater tolerance for dry conditions and the ability to recover rapidly from a catastrophic environmental disturbance such as a fire or a flood. This list is drawn from "Trees, Shrubs, and Woody Vines in Kansas", by H. A. Stephens, University of Kansas Press, 1969. It includes 114 species. The taxonomic order of families follows the second edition of the "Flora of the Great Plains," University of Kansas press, 1991. It is meant to be representative rather than a complete listing for Kansas. For even more information about plants in Kansas check out The Meadow! Salt Cedar - Tamarix sp.